In SimCity 4, you don't just build your city, you breathe life into it. With god-like powers, you sculpt mountains, gouge riverbeds, and seed forests to lay the groundwork for your creation. Then construct the most realistic metropolis you can imagine. Your city comes alive with the hustle and bustle of construction crews, the snarl of traffic and the activity of your Sims. Build mansions on mountainsides, cross canyons with bridges and raise skyscrapers downtown. 33 Thomas Street, called as AT&T Long Lines Building is back from the clouds. I was thinking, All those asks, do you have AT&T Long Lines Building? Yes I Do. And you can have it either. 33 Thomas Street, called as AT&T Long Lines Building is back from the clouds. I was thinking, All those asks, do you have AT&T Long Lines Building? And you can have it either. Only for Sim City 4. Download the File, Put it into your plugin folder. BTW: The building has no nightlight. 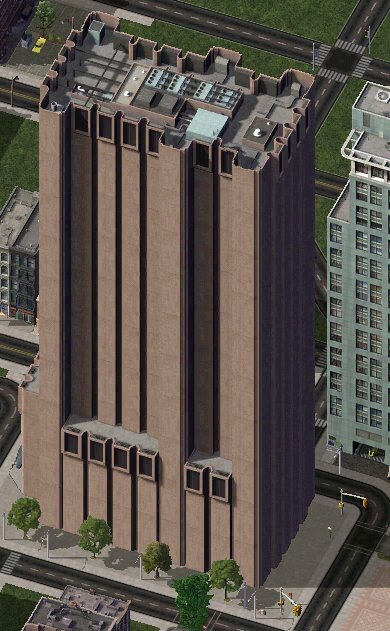 In original it's doesn't have it, It's the darkest Skyscraper in New York.